The Within-host Modeling of MAP Infection Working Group has had an extremely productive few years and its work has paid off in a dedicated special issue this month of the journal Veterinary Research. Ten of the twelve papers in the issue were produced by the Working Group. 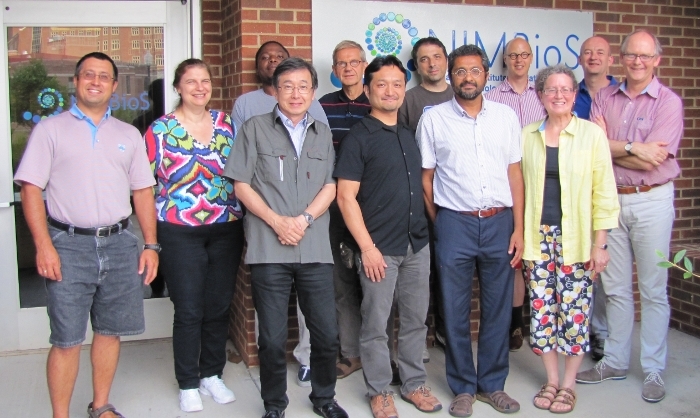 The Working Group on MAP, which stands for Mycobacterium avium subsp. paratuberculosis, held its first meeting at NIMBioS in June 2012 and wrapped up after the fourth meeting in July last year. The group comprises 16 members from diverse fields, including mathematics, statistics, epidemiology, immunology, microbiology and optimal control and is co-organized by Ynte H. Schukken, Cornell Univ. ; Ad Koets, Utrecht Univ. ; Srinand Sreevatsan, Univ. of Minnesota; Maia Martcheva, Univ. of Florida; and Shigetoshi Eda, Univ. of Tennessee, Knoxville. The Working Group was established following a successful Investigative Workshop on the topic held in the summer of 2011. The chief objective of the Working Group was to develop a within-host MAP infection model, using observational data on infection patterns and within-host immune response data. Ultimately, the model aimed to provide an understanding of the progression of and mitigation strategies for Johne’s disease in ruminants, which is caused by intestinal infection of the bacterial pathogen MAP. JD causes reduction of milk production, weight loss, and premature culling of clinically affected animals. JD has been found in more than two-thirds of US dairy herds and causes the US dairy industry an estimated annual loss of hundred millions of dollars. The special issue of Veterinary Research published this month is a compilation of work that explores and connects MAP dynamics at multiple levels. Congratulations to this hard-working and productive Group! This entry was posted in disease, publication, research, Wildlife, Working Groups and tagged disease, publications, research, Working Group. Bookmark the permalink.